Brett’s short play Representation will be featured in the upcoming Rule of 7×7. Brett will also be acting in the piece. The play follows two actors vying for commercial representation in the same audition. Brett plays a young agent. Co-starring Matt Stango, Max Reinhardsen, Olivia Stoker. Dir: Bradley Anderson. 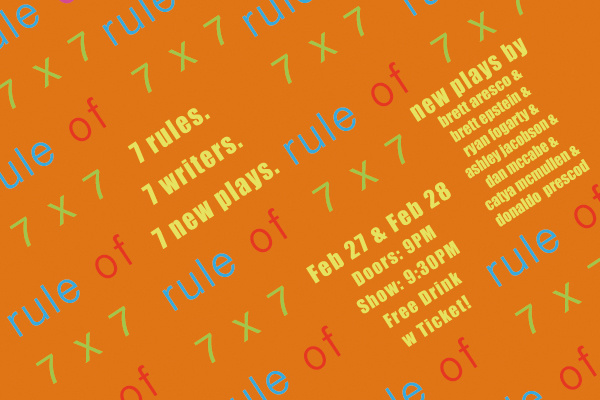 RULE OF 7×7: 7 writers, 7 rules, 7 short plays, 2 nights only. Tickets: $10 in advance (HERE!) or $12 door. Free drink included with ticket purchase!